The patient information provided here will help you prepare for your visit and allow you to get acquainted with Piedmont Retina Specialists. Dr. Jason Sanders, Dr. Charles Richards and Dr. Nathan Haines are board certified and fellowship trained retina surgeons. Because they know how stressful eye treatment can be, they are dedicated to providing the highest quality patient care and personal service while using the most advanced diagnostic and therapeutic equipment available. They specialize in the treatment of diseases affecting the back of the eye, specifically those of the retina, vitreous, and macula. If your physician or ophthalmologist suspects a retinal issue, you will need a referral to see Dr. Sanders, Dr. Richards or Dr. Haines. A retina specialist is a medical doctor trained as an ophthalmologist, who has received additional fellowship training in diseases and surgery of the vitreous and retina. Dr. Sanders, Dr. Richards and Dr. Haines commonly treat diabetic eye disease, vitreous hemorrhage, macular degeneration, retinal detachments, uveitis, and ocular tumors. 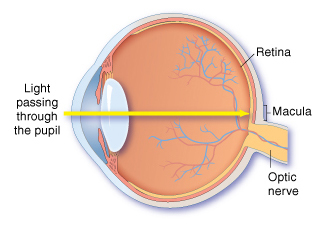 The retina is the thin sheet of nerve cells including the light-sensitive cells which you may know as "rods and cones." In the retina, light is converted into electrical signals, processed by the brain, which allows "seeing" to take place. Appointments may be arranged during the hours of 8:00 AM - 5:00 PM. (336 369-7100 - Greensboro | 336 397-9700 - Winston-Salem). After hours emergencies are routed to the physician on call. When you call our office for an appointment, briefly tell the receptionist about your eye problem so that the proper amount of time can be allotted for your appointment. Also, please tell the receptionist if you will require any special help for your visit. Typically, your first visit will take at least two hours and will consist of a complete eye examination. Because your eyes will be dilated, it is necessary for someone to drive you home after your appointment. Your first appointment with us will involve a comprehensive eye evaluation, including a detailed examination of your vitreous and retina. You will have drops applied to your eyes which dilates the pupils so that Dr. Sanders, Dr. Richards or Dr. Haines can examine the retina. It takes at least twenty minutes for the drops to work, so you will be asked to return to the waiting room until your eyes are ready for examination. Please set aside at least two hours for your initial consultation. If additional tests are required, your visit could be prolonged. Photography of your eyes may be required. This procedure takes twenty minutes. The images are developed quickly on-site, and Dr. Sanders, Dr. Richards or Dr. Haines will discuss the results with you. Bring a light snack and something to drink. Patients with diabetes should bring their medications with them. Depending on the results of the eye photos, it is often possible for immediate treatment to be applied. If not, the doctor will discuss further management with you before you check out. We also recommend that you bring something to read or do while waiting. Most surgeries are performed as an outpatient procedure under local anesthesia and may not require an overnight stay in the hospital. We are fully equipped to perform in-office laser procedures. We want you to get all of the benefits you are eligible for from your health insurance coverage. We work with all major insurance companies including Medicare and Medicaid plans. Please be sure to bring your insurance cards and referral forms for your first visit. If you are a member of an HMO, you must have an authorization number and/or your physician referral with you. Otherwise, your examination could be cancelled or delayed. Also, expect to pay your co-payment and any deductible amounts at the time of your appointment. If special payment arrangements are necessary, please contact our office staff prior to your appointment. Most plans also require preauthorization before any type of surgical procedure. If you are uncertain about your coverage, please call your plan's customer service representative. If you need assistance, we would be glad to help you. Because we also file all private insurance forms for the convenience of our patients, it is important that you bring your insurance cards with you at every visit so that we have accurate information about your coverage. Medicaid patients need to bring their current card along on each visit as well. This simple screening test is used to detect vision changes by assessing the macula. You can test your vision on your own daily by using the grid shown here. You can also print out your own copy of the Amsler Grid for use at home. 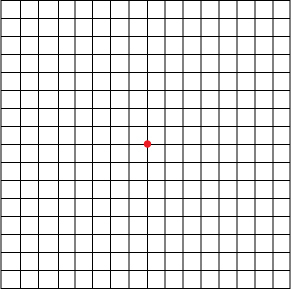 A small dot is located in the center of the grid for fixation. While focusing on the dot in the center, look for wavy lines or missing areas of the grid and look to make sure you can see the corner and sides of the square. You can test both eyes at once or you can cover one eye at a time and repeat the test. If you notice any irregularities, mark areas of the chart that you're not seeing properly and bring it with you to your eye exam. You can also click here to print out the grid.